Azure Site Recovery is a vital part of the business continuity strategy of many Azure customers. Customers rely on Azure Site Recovery to protect their mission critical IT systems, maintain compliance, and ensure that their businesses aren’t impacted adversely in the event of a disaster. Operationalizing a business continuity plan and making sure that it meets your organization’s business continuity objectives is complex. The only way to know if the plan works is by performing periodic tests. Even with periodic tests, you can never be certain that it will work seamlessly the next time around due to variables such as configuration drift and resource availability, among others. Monitoring for something as critical should not to be so difficult. 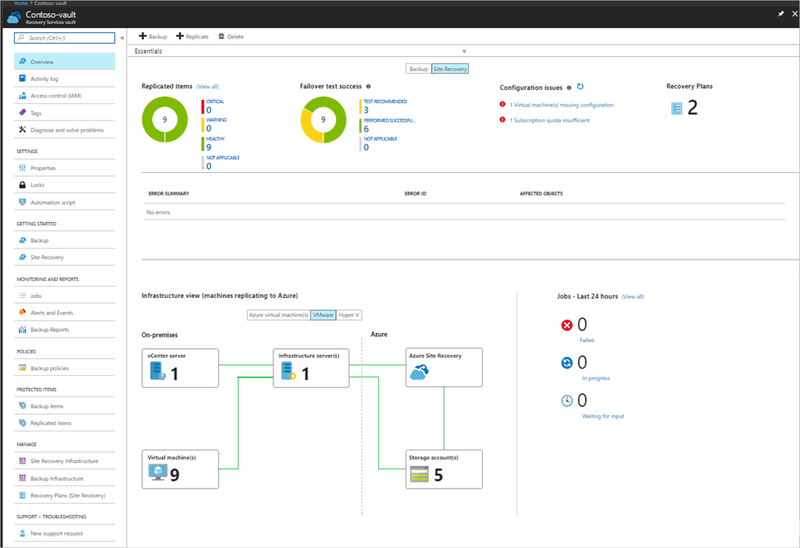 The comprehensive monitoring capabilities within Azure Site Recovery gives you full visibility into whether your business continuity objectives are being met. Not just that, with a failover readiness model that monitors resource availability and suggests configurations based on best practices, it also helps inform how prepared you are to react to a disaster today. So, what is new in this experience? Enhanced vault overview page: The new vault overview page features a dashboard that presents everything you need to know to understand if your business continuity objectives are being met. In addition to the information needed to understand the current health of your business continuity plan, the dashboard features recommendations based on best practices, and in-built tooling for troubleshooting issues that you may be facing. Replication health model: Continuous, real time monitoring of replication health of servers based on an assessment of a wide range of replication parameters. Failover readiness model: A failover readiness model based on a comprehensive checklist of configuration and disaster recovery best practices, and resource availability monitoring, to help gauge your level of disaster preparedness. Simplified troubleshooting experience: Start at the vault dashboard and dive deeper using an intuitive navigational experience to get in depth visibility into individual components, and additional troubleshooting tools including a brand new dashboard for replicated machines. In-depth anomaly detection tooling to detect error symptoms, and offer prescriptive guidance for remediation. With best in class monitoring, Azure Site Recovery gives businesses insurance against disasters with a DR strategy that you know will work when you need it the most. Learn more about monitoring and troubleshooting with Azure Site Recovery from our documentation. Get started with Azure Site Recovery today.